Are you looking for a preventive solution for grubs, fleas and fire ants? Going organic is the answer! Manage your insect problems from naturally occurring insect predators. 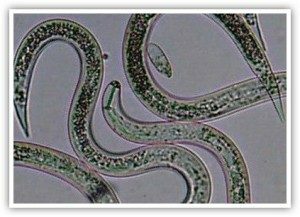 Beneficial nematodes are naturally occurring microscopic organisms and are not harmful to humans, pets, wildlife, birds, soil, earthworms, water sources, or the atmosphere. Nematodes are natural predators that migrate through the soil, feeding on insect larvae and reducing unwanted insect populations. Nematodes are effective against over 250 species of pest insects, in effect making them an organic pesticide! For turf and lawns, nematodes are particularly effective, but application timing methods are critical for success. They attack Grubs, Fleas & Fire Ants. Schedule an aeration service before your treatment application. This will facilitate soil penetration and improve the control process. Water the lawn 1/2 inch the day before the scheduled appointment. This will help encourage existing insects to move closer to the surface, making it easier for the nematode application to be effective. Allow your lawn to stay moist for 10 days after the application. This will ensure the survival rate of the nematodes in the soil. Nematodes are very sensitive to sunlight. Applications during full sun will result in high mortality rates. For best results, a WeedPro® representative will schedule your application during the morning or evening hours on rainy overcast weather days. A true organic weed killer is made from natural sources without the use of any man-made ingredients or any of the ingredients being chemically altered. In years past, organic weed killers were very expensive and far less effective than synthetic products, creating doubt about organic products altogether, until now! At WeedPro® Lawn Care, we are constantly testing and researching the latest organic weed control products so you don’t have to. We are leaders in Ecology-Friendly Lawn Care, offering a true organic herbicide treatment option that really works! How do Natural Weed Control Products Compare to Synthetic Weed Killers such as Glyphosate? Simply stated, they work great! We only use registered non-selective weed management products to reduce weed populations within our Organic Weed Killer program. These products contain an active ingredient call d-limonene that is an all natural product (derived from citrus fruits, etc). The products used in your application start to show effects much faster than synthetic weed killers, often showing results in 1-2 hours. Our products are EPA registered, carry seals of authenticity from the USDA National Organics Program, and are registered as OMRI approved products. Glyphosate is a very popular broad-spectrum synthetic chemical for weed control. It is made in huge quantities and can be purchased in most home and garden centers across the United States. Depending on current weather conditions, this chemical typically requires 7 to 14 days for the host plant to wither and die. In the past, this timeframe has been viewed as very effective, but in comparison to the natural products now available, in most cases, we can achieve these same results faster using all natural organics, thus creating less need for chemical dependency. No matter whether you’re looking for organic pesticides or organic herbicides, WeedPro Lawn Care is ready to deliver the perfect yard treatments. Contact us today!